The weather outside is cold in late March of 2014. But the temperature inside the main entrance of the Botanical Garden in Washington DC was comfortably warm, maybe even a bit humid! Flowers from every climate in the United States were on display throughout the garden. Flowers in full bloom were thoughtfully placed everywhere! The main room was the most amazing with a fountain with shooting water colored with lights that is synchronized to the music. If it's cold or raining, it is good to know that this botanical garden is completely indoors. Like most museums in DC, admission was free. We walked briskly through the various rooms of the botanical garden and were in and out in about an hour. Some rooms we enjoyed more than others. For the one's we enjoyed the most, we took a moment to sit on benches, rest our legs, and enjoy the music. Compared to other botanical gardens, the one in Washington DC was on the smaller side, especially since it was all indoors. 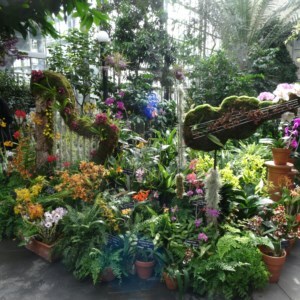 However, the layout of the flowers at the US Botanical Garden, paired with the soothing music was a hit. Other botanical garden often times have a large outdoor component in wide open spaces, but repeat a lot of the same flowers in patches. Washington DC's botanical garden would have a couple of each plant, providing more variety without having to walk as far. Compared to the other museums in Washington DC, the botanical garden is probably one of the smallest. Walkways are narrow in certain spots and popular exhibits are crowded. Be prepared to be patient while other guests take pictures. All in all, the US Botanical Garden is right in the Mall, which makes it a must see attraction if you're visiting the US Capital. Transportation is easy because it is right off the Metro line. Because the garden is small, you won't need to budget much time for the visit and can be easily completed in one stop.